Levi Roots presents… The Ultimate Reggae Album for this Summer! Get July 21st in your diary, the soundtrack to your summer has arrived! Levi Roots presents “Reggae Reggae Hits”, the ultimate sizzling musical soundtrack to your summer. 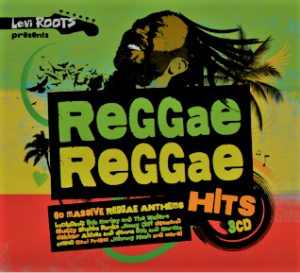 For the very first time Levi Roots has curated a selection of his favourite reggae songs and the result is this storming collection of classics. It’s the perfect fusion of Caribbean vibes, laid back reggae and BBQ party fun. The triple album features 60 tracks with 27 top 5 hits hit singles including Bob Marley – The Sun Is Shining, Shaggy – Oh Carolina and It Wasn’t Me, and Johnny Nash – I Can See Clearly Now. Also featured is the original version of You’re Wondering Now – theme song to the hugely popular BBC TV series ‘Murder In Paradise’- plus many original classics from the home of Reggae, Trojan Records. Highlights include Althea and Donna – Uptown Top Ranking, Ken Boothe – Everything I Own, Bob and Marcia – Young Gifted and Black and Desmond Dekker and The Aces – Israelites. The album also features Levi’s very own A Message To You Rudi, and his recording of the worldwide hit, Don’t Worry Be Happy. The rise of reggae musician Levi Roots is one of the most heart-warming success stories in recent times. Known today for not only his sauce and culinary expertise, Levi’s popular and prominent TV presence coinciding with his commanding Radio 2 programme means he’s still firmly in the public eye.